A new texture hack that turns Sunny Beach into Snowwy Beach. If nobody replies to it, I'm gonna start editing new texture hacks into this post so I don't have to double post so darn much. Everyone seems to have trouble with those elephant snails. It's been a while since I've played so I don't remember if I was one of them. Here's a pretty creepy texture hack for Spyro 1. Not playable, sadly, just for the Spyro World Viewer. I've done a few games with alternate controls (Soul Calibur II, Game Cube Bongos) but nothing really successful came of it. Cheers to him. I was thinking, one of the head scratchers or fridge pages says the reason Spyro's basic flame is ineffective against metal armor is that it is simply too short of a burst. Legends Spyro can keep his flame stream blowing much longer, explaining why he doesn't have the same problem. A major update on that 2D sidescrolling pixel-art fangame. This looks really awesome so far. I think this fangame has the highest probability of actually being completed someday since it's not quite as ambitious as all those fully 3D Spyro fangames floating around out there. Also, CrystalFissure's got a new hack using Banjo-Kazooie textures. Lastly, here's the skatepark from Enchanted Towers converted into a Grand Theft Auto map. Someone made a fan-made Spyro level (not actually playable, sadly) in a polygonal "PS1 artstyle." This beautiful rendition of the classic hit song "Spyro the Magic Dragon" is sure to move you to tears. 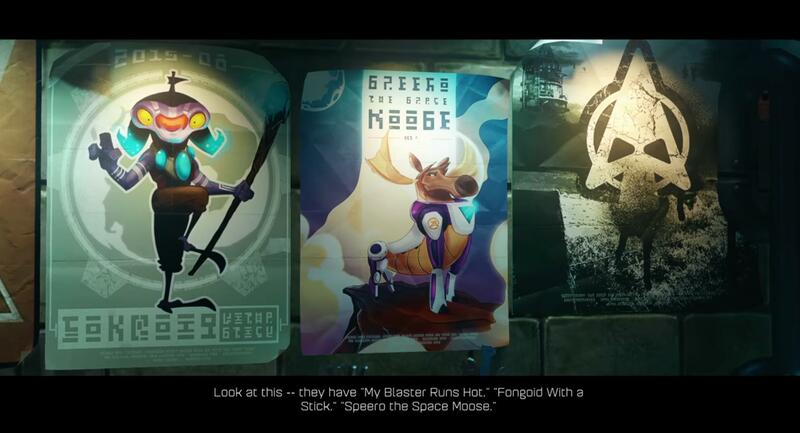 The newly-released Ratchet and Clank reboot has a reference to a certain purple dragon it in. ◊ It probably doesn't mean anything, but... I REALLY WANT IT TO MEAN SOMETHING! MAYBE THIS IS SOME SORT OF WEIRD HINT THAT ACTIVISION IS LETTING THEM MAKE A NEW SPYRO STANDALONE GAME? While my girlfriend would want a new Insomniac Spyro to be true, that's probably just grasping at straws right now. As we know, Activision have the Skyro Academy animated series coming. Can't lend Spyro to Insomniac to star in a non-Skyro standalone game to confuse the kids, right? It's a bit interesting how the Spyro games in the original trilogy differed. The first game was mostly about exploration. Travelling through all the different environments, collecting treasure and fighting bad guys, with some quite cleverly hidden secrets (the bog world was had loads of these). The second game had a lot more interaction, and it probably benefited from it. The worlds felt a lot more fleshed out and varied as opposed to the first game, but I will admit that there were some minigames that made me want to throw various things at the console and/or television. I think the third game was a hybrid of the two. By giving the collectables names again, it gave them a bit of a unique twist to them, but it still kept the fleshed out worlds and interactions of the second game. Also had the most satisfying method of evening the score with moneybags. As a kid, I never found the flight level in the swamp world. I assumed for some reason that world didn't have one, until I found it on a replay years later. Cortex needs to take a 12-step programme off a 10-step pier. I'd chop off my right arm if someone could make a fully playable ROM where every level has altered music and textures. In response to stuff on the last page, Castlevania: Symphony of the Night actually goes up to 200% completion. Anyway. I've only ever played the Insomniac classics (Year of the Dragon being my fave), but I've been wondering... are the Legend games worth playing? Maybe, if you liked playing through a lord of the rings-inspired story. And if you liked spectacle action games like Devil May Cry, only not as great. The handheld ports run the gamut across genres. The DS version of A New Beginning is an unplayable mess. The DS version of Eternal Night is a (worse than console) spectacle action game with some platforming. The DS version of Dawn of the Dragon is a 2D platformer. First off, be sure you go into Legend of Spyro knowling full well that it's NOT classic Spyro. Treat it like a totally different franchise. There's no continuity whatsoever besides a couple Mythology Gags. The first game is a little bland and repetitive with a generic story, but the second game improves on the gameplay a bit and has a much better story. The third game drops the ball with the story but makes up for it with the best gameplay in the series. It's the only Spyro game to date where you can fly at any time, and it's got some beautiful levels. Don't forget the GBA version of The Eternal Night is a Metroidvania. Well, I mentioned the DS games since I have experience so I write what I know. A metroidvania sounds interesting. Eternal Night on GBA, right? I'd better try that sometime. I'd say the legends games are worth playing, though I only know of the home console versions. On the story side, I have mixed feelings. I never saw the need to make them the protagonist Spyro, given the radical departures and all...though even that's mostly from a game play perspective, as plenty of other games stayed a lot closer to the original trilogy plots but not so much game play. On the other hand, I would be interested in seeing where that new story went. The Legends trilogy were basically one continuous arc with a time skip, they finally finished it but then Cut Short. On the positive, it was a good place for Happily Ever After and it's fun to play the two trilogies alongside each other, comparing how each developed. I feel like I would've enjoyed Legend of Spyro a little more if it wasn't part of the Spyro franchise and was just 100% its own thing. Like, they could've made the protagonist a "magical golden dragon" or something instead of a purple one, then change the dragonflies into fairies and make Hunter the Cheetah into "Darkpaw the Tiger" or whatever, and boom, it's a whole separate franchise now. According to Spyro wiki, the Finnish translation gives Spyro a totally different name that means "Wildfire." Well Spyro has always been about a Portal Network. There was a whole world called Avalar where no one had even heard of dragons that he got sucked off to, in the third game we learned The Dragon Realms were not even the dragon's original home but they had previously been in what had became The Forgotten Worlds in their absence. I could see a "What About The Astronauts" equivalent to the setting, where the Sorceress didn't hit all of the Forgotten Worlds dragons but those that were off world got the message not to come back because she had gone mad, just fled or went through what turned out to be an unstable one way portal and were presumed dead. Point being I could buy a whole different group of dragons in the setting who developed totally different behavior and abilities over time. I could buy the tone of games about a dragon from said group, the game play of dragon from said group being totally different. While not as extreme, Wario is in the same series as Mario Bros., despite often having completely different game play(WarioWare), and for that matter, so is Donkey Kong Country. More extreme would be Punch-Out! !, which is so far removed it's easy to forget it's connected to Mario too. That's all it'd take. A little side reference or cameo. Ripto ge's stomped by this separate, more militant group of dragons with abilities we had never seen before as part of a gag during a cut scene, explaining why he had come to hate dragons so much. Some rhynocs try to locate the lost group of dragons, on the off case Bianca's raid on the other side of the world fails, they get roasted by Ignitus, showing how he competently defended the eggs before he was over whelmed by Cynder, or they get crushed forces of Malefore while trying to run off with eggs, as a psych out to players who recognized and expected to fight rhynocs. Spyro isn't rebooted, so we can still have the more games in the style of the Insomniac trilogy, if anyone ever gets any ideas for that kind of thing, and we can have a surprise crossover or cross through between the two series later. One of the writers for the upcoming Skylanders show revealed more info, but it was taken down for violating an NDA . If it's true, it looks like the show will have a mix of lighter and darker moments (The tone was compared to Gravity Falls) and Cynder will be appearing in season two with her own story arc. A retelling of her backstory from Legend of Spyro, maybe? The progress they've made is very encouraging. I've seen way too many promising 3D Spyro fangames get cancelled, but surely a small simplistic pixel art game like this one's got a fighting chance, right? Never actually knew that there was a Spyro the Dragon thread here; the original Insomniac trilogy was probably the first video game series I ever played before, so I like how the franchise is still getting some love from its fans.